What makes them all so great is their deceptive simplicity. I love the language of a good children’s book. The rhythm, the rhyme, the repetition. The way every single word is carefully selected for its exact sound and meaning. I heard one of today’s best children’s authors, Julia Donaldson (we didn’t read any of hers tonight, but she’s a big hit with my girls) recently talk on the radio about just how long it takes her to write her stories. She works and works and works at getting the words just right. Until it’s perfect and you couldn’t imagine it being written any other way. That’s what beautifully crafted copy is all about. It looks easy to do but it isn’t. We should approach all copywriting in this way. I don’t necessarily mean writing with young children in mind – although sometimes the best way to write about complicated concepts is to imagine explaining it to an eight year old child. It’s to do with honing your words until it all seems so simple you couldn’t imagine another way of saying it. Oh, and try reading it out loud as well. That always helps. As would pictures by Quentin Blake or Emily Gravett. If only clients would let me commission illustrators like these to spice up their annual reports! 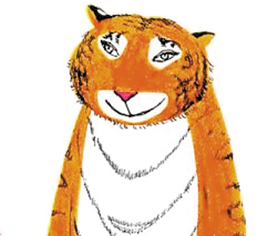 This entry was posted in Family life, Writing and tagged bedtime stories, children, children's books, copywriting, emily gravett, judith kerr, julia donaldson, quentin blake by Vanesther. Bookmark the permalink.